Quick (100-150 ms) response time.1 n Standard accuracy ± (0.5% RD + 0.2% FS). n 200 to 1 turn-down ratio. All 3 user selectable analog input and output interfaces are standard: 0-5Vdc, 0-10Vdc, 4-20mA. Universal 12-26 Vdc power supply input. 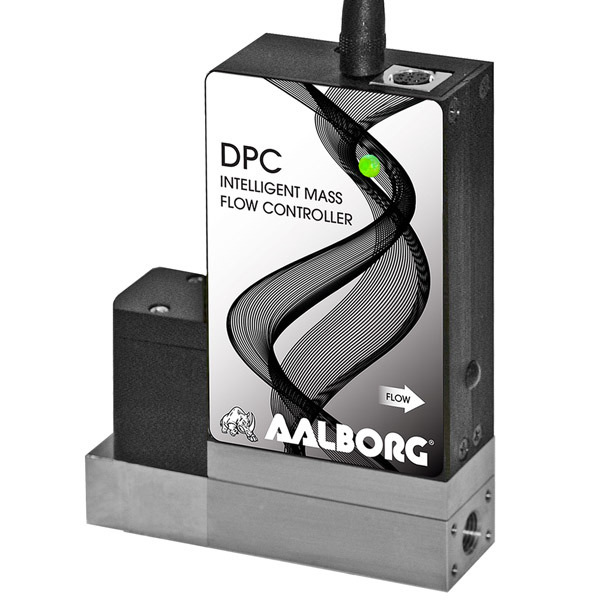 Aalborg Instruments’ DPC series precision digital mass flow controllers provide accurate and stable control of mass flow rate, of process gases. Inherent simultaneous displays of Mass Flow, Volumetric Flow, Pressure and Temperature parameters promote applications in a variety of industries such as scientific and analytical applications, bioreactors and surface depositions, gas sampling, manufacturing and metrology activities. DPC precision digital mass flow controllers incorporate multi-gas functionalities allowing users on site to select up to 30 different gases locally via optional OLED/Joystick interface, remotely via the RS232/RS485 interface or optional Modbus RTU interface. DPC flow controllers support various functions including: user selectable local, analog, digital or program set point control, two programmable flow totalizers, LOW, HIGH or RANGE FLOW, temperature and pressure alarms, automatic zero adjustment (activated via local or communication interface), programmable SSR relay, programmable 0-5 Vdc, 0-10 Vdc or 4-20 mA analog inputs and outputs, user-programmable pulse output (via SSR), and extensive self-diagnostics functionality. 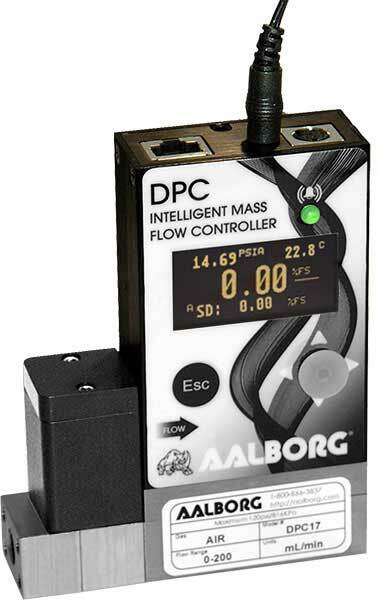 AALBORG DPC series mass flow controllers Totalizers with batch processing mode, high ±(0.5% RD + 0.2%FS) standard accuracy, 200:1 turn-down ratio and less than 150 ms response time allow users to save considerable costs of owning and installation discreet application specific instruments required to perform similar control and measurement.